While I’m really happy that the scatter graphics I’ve been churning out for the past four years continue to be so well-received, I’ve long wished for them to look a bit prettier. During last season, @bootifulgame and I produced an experimental interactive version which looked much nicer and used striped “contours” to better distinguish which teams were performing better than others. It’s taken me a while to get around to it, but I’ve adapted the code to produce a static version that I’m pretty happy with. You can click any of the graphics to bring up a full-sized version in a new tab. Before we look at the position of the clubs, I just wanted to flag what’s changed. The biggest structural difference between this and the old version is that rather than only shading the outlying areas of the graphic, the entire thing is now coloured in using the standard “green = good, red = bad” approach. The diagonal lines are basically contours where, in this case, the ratio between shots taken and shots faced is the same. The axes are still centred on the average and one of the diagonal lines passes right through it – this is the line where shots taken = shots faced, so everything below it contains teams who take more shots than they face, with the stripes getting greener as they get more dominant, and everything above it contains teams who face more than they take. 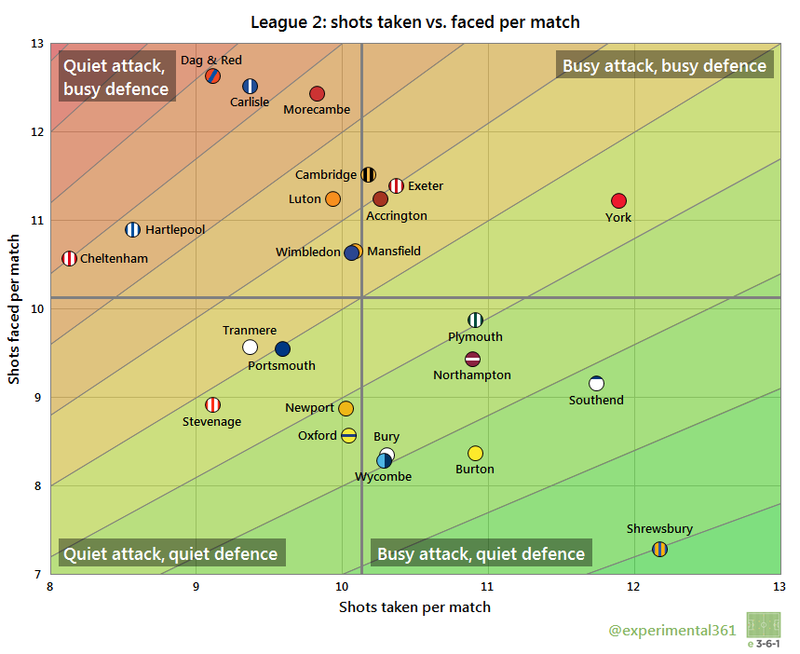 Despite their disappointing season, York took more shots at goal than everybody except promoted Shrewsbury, who themselves allowed the fewest in return. Stevenage made the play-offs despite only two sides taking fewer shots than them. The next graphic will show how they pulled that off. Three sides – Dagenham & Redbridge, Carlisle and Morecambe – allowed significantly more shots at their goal than anyone else, but none of them went down. The contours now show sides who scored goals at the same rate, so clubs in a greener stripe have scored more goals per match and vice versa. Wycombe, Northampton and Shrewsbury – all tucked in alongside the same line here – each scored 67 goals, although the Shrews needed around two extra shots per match than the Chairboys to rack up the same total. York‘s failure to turn their shots into goals is apparent here. Despite only Shrewsbury out-shooting them, they needed three attempts more than the average side to score each goal – only Mansfield fared worse at converting their efforts. 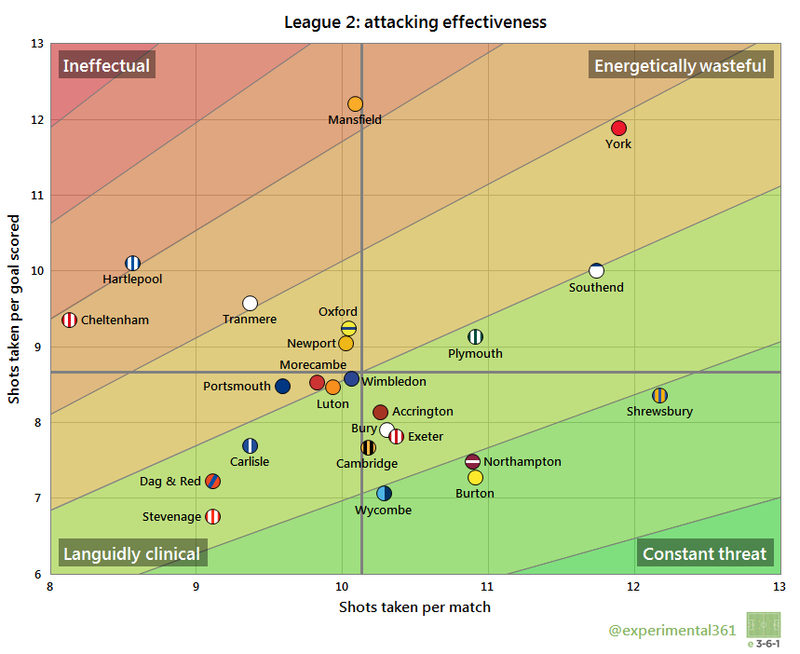 The most clinical side in the division were Stevenage, who made the most of a relatively small number of shots. The stripes now pick out clubs who have conceded at the same rate e.g. Newport, Stevenage and Portsmouth each conceded 54 goals from 46 matches and sit alongside the same line as a result. 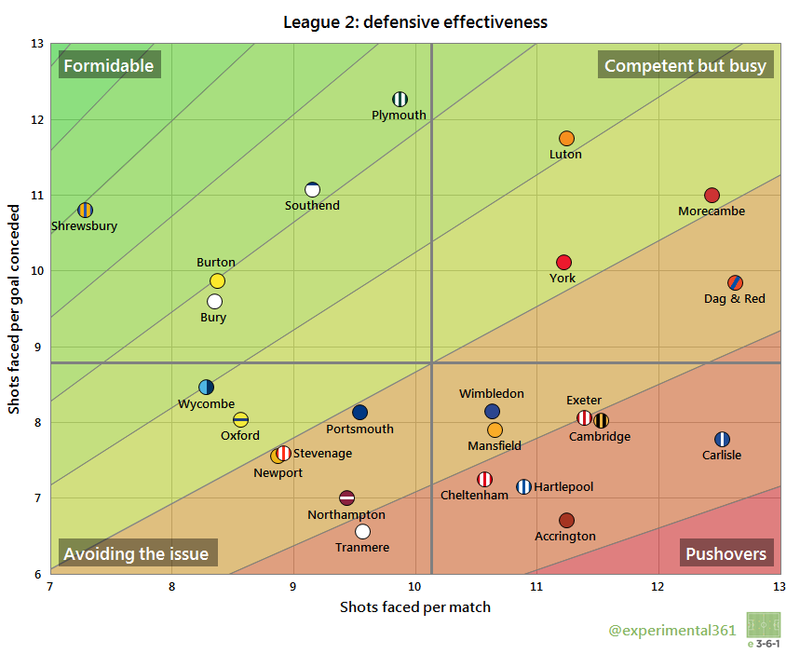 Plymouth‘s run to the play-offs was built on a strong defence – the division’s most resilient and requiring almost twice as many shots to breach as Tranmere‘s (the most porous). While Morecambe and Carlisle allowed a similarly high number of attempts at their goal, it required more than three extra efforts on average to breach the Shrimps’ back line. Shrewsbury were by far the best at restricting their opponents’ chances, which saw them concede the fewest goals despite four sides proving tougher to break down. I’m still experimenting with how wide to make each stripe and to tie them to something tangible. At the moment I’ve picked numbers that give a sensible number of stripes, but I’ll make this more explicit in future posts.